This animal pen drying fan attachment was designed to be used with our Xpower X-430TF. The E-430TF is a durable air mover built with a built in timer and includes a filter kit so it can be used in areas with lots of debris. The attachment itself has three 9' hoses that can direct air into different animal enclosure pens. One air mover can be used to dry multiple fans after cleaning out the kennels/pens. If it is an extremely hot or humid day, this attachment can also be used to cool your pets down. If only 2 hoses are need to direct air a shut off gate is located at the end of each hose to shut off the flow of air. Each hose has an inside diameter of 4.75". Each shut off gate has 2 hooks on it to hang from kennel bars. 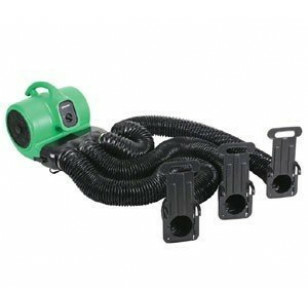 For more air mover accessories, please take a look at our full line of air mover ductwork & filters. This is a review for the Animal Pen Drying Fan Attachment.